Whatever the tool, it always should bring you a lot of productivity!!! And with productivity we mean: the tool does the heavy work for you. 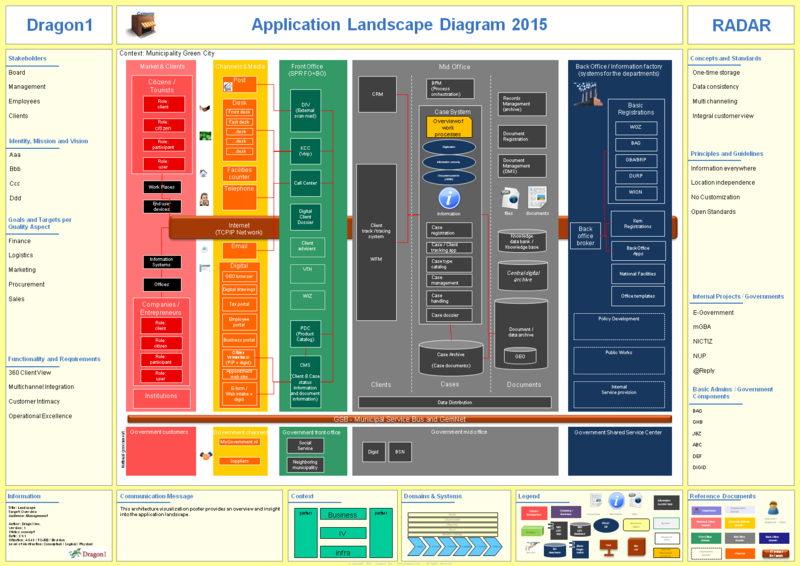 Dragon1 is a tool that generates Application Landscape Diagrams for you. Like the one the right. 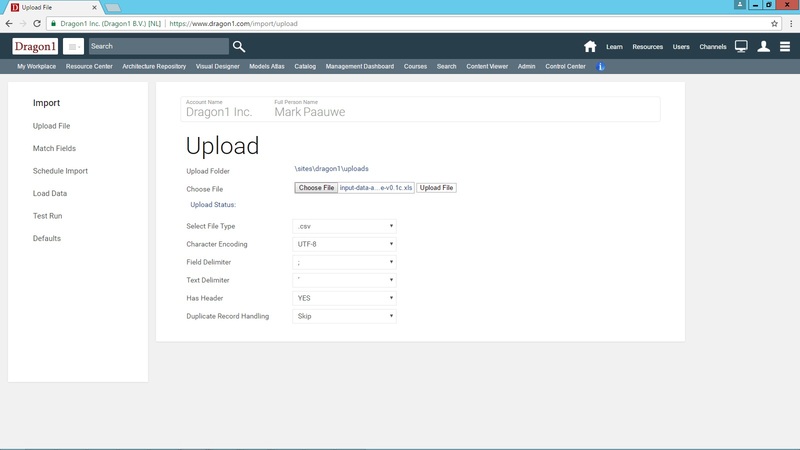 Dragon1 is a digital platform with web applications like the Architecture Repository and the Visual Designer. These two help you to become more productive: they generate an application landscape for you (i.e. several views). Go to the Step by Step guide here: https://www.dragon1.com/help/step-by-step-guide. Now with this information you can already do a lot of application landscape generation. But first let us import the data. In the second screenshot you see how we have setup the import tool to import the data file. In the third screenshot you see how we have mapped the input of the file onto known data types in the Architecture Repository. In the fourth screenshot you see the data imported in the Architecture Repository. If you want, you can do some data enriching or tweaking here in the Architecture Repository. 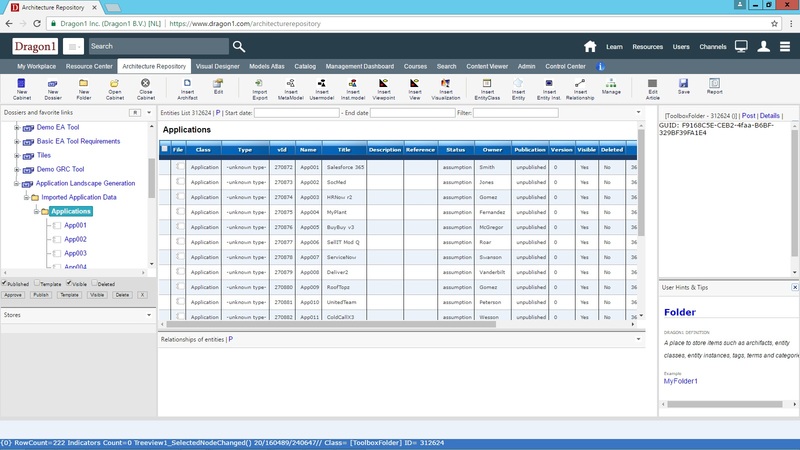 Wouldn't it be nice if you could generate an overview of an application domain and click on a domain to drill down to the applications in that domain and next you could choose between several views of that domain? On Dragon1 you can do that! First you create a model of your data (meaning you create relationships between the data elements). Next you define views with rules on top of your data (to filter out unnecessary data). 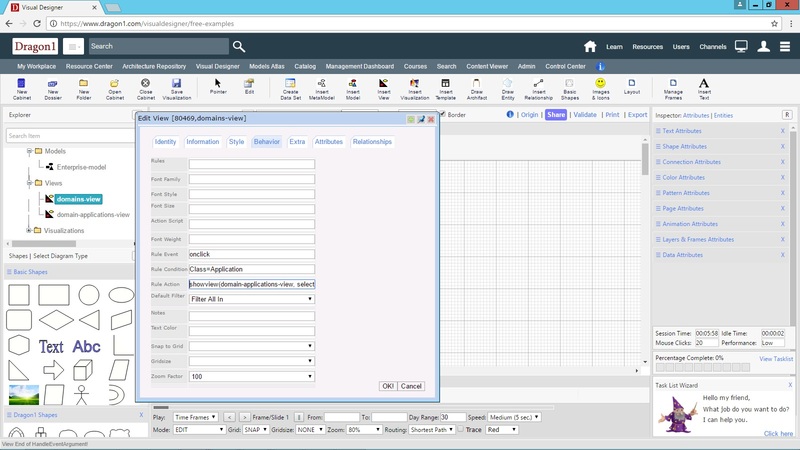 In the next screenshot you see how to setup a rule in the domains view to drill down on click to an applications view. You can set up to 10 rules in one view. One other rule that is set for this view is: getting all the domain data from the model, and drawing it with the rectangle shape in a matrix shape (left to right, top to bottom). 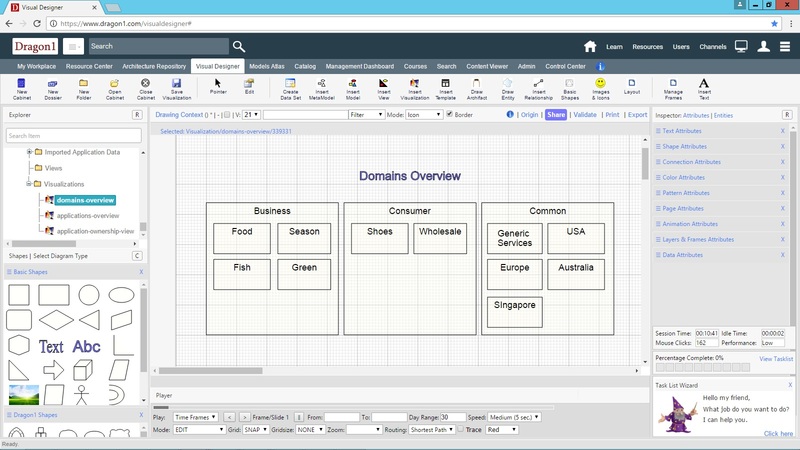 In the next screenshot you see a generated domains overview using the view that was linked to a visualization. 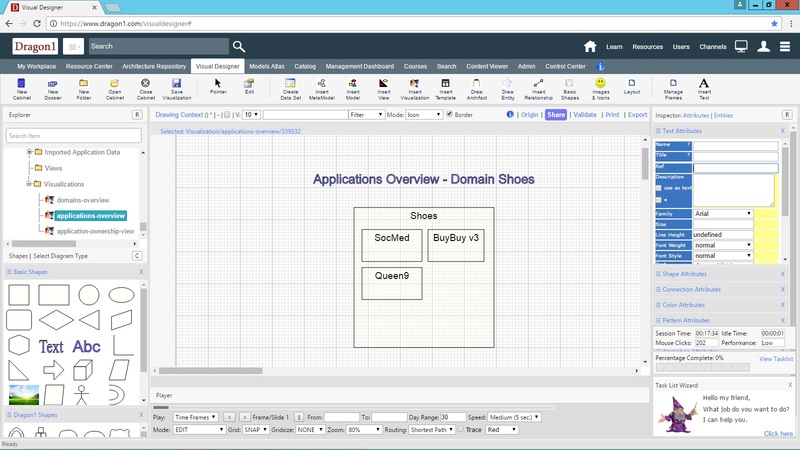 In the next screenshot you see a generated application overview that is shown if you down drill on the shoes domain. This will do for now: we were able to generate a basic landscape. Once the application landscape is generated (with the first four or five views), you might want to change the default shapes and colors a bit. You can also use a color stylesheet and corporate branding with logs to create a very effective visual. You can also add a rule to the view stating that shapes need to get a color if an attribute has a certain value. For instance, color all the application red that has the contract missing. The last thing now is to publish the visualizations, by clicking on the blue share button in the Visual Designer, so the visualizations are visible in the Content Viewer. Now you are all set to mail the link to a stakeholder. In the next screenshot, you see how the stakeholder can browse and view your application landscape on his mobile device. 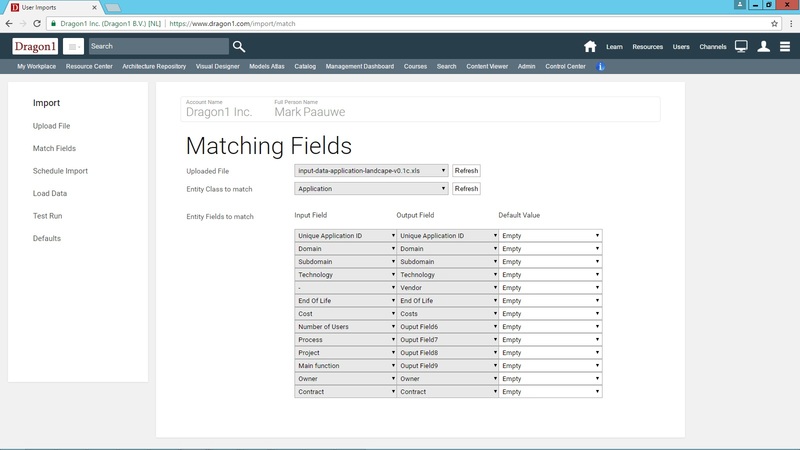 If you want to generate application landscapes yourself on Dragon1, you only have to purchase a Dragon1 PRO User License and we will support you all the way via email, phone and Skype. If you want to see more examples of what you can generate and model on Dragon1, take a look at the examples page. If you invest 5000 EURO we will create and generate your Application Landscape Diagram. 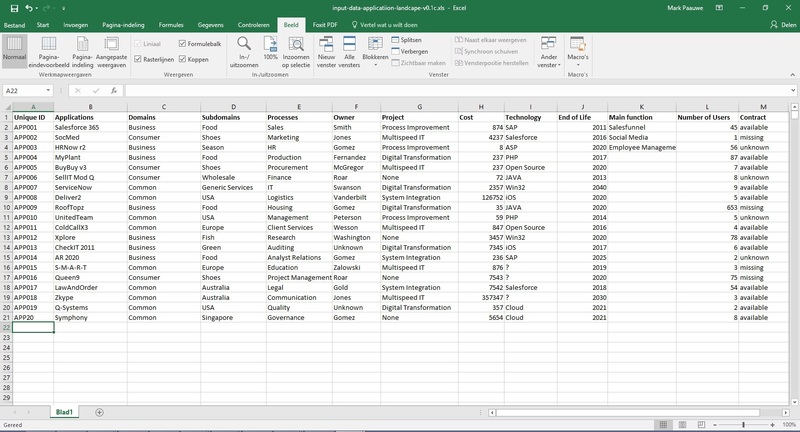 You only have to provide an excel sheet with the data.